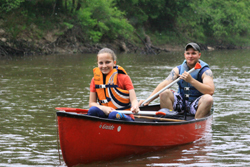 This 21-mile trail has multiple access sites to help you create the best float time for you, whether you are looking for an easy one-hour paddle or an all day outdoors experience. With beautiful white sandy beaches and sandbars, amazing wildlife diversity and tall East Texas trees, this beautiful trail is not to be missed. ALERT: The launch at Village Creek State Park is CLOSED indefinitely due to flood damage. 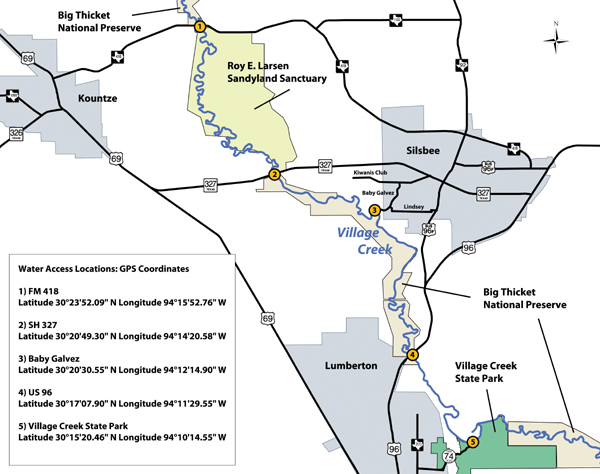 All other launch/takeout points for the Village Creek Paddling Trail are intact (FM 418, Hwy 327, Baby Galvez, and US 96) so paddling on the creek is still possible, just not at the state park. The next take out below the Village Creek State Park site is on the Neches River, not on the creek, and that distance is almost a full day paddle. Please plan your trip to utilize the up-river sites only. From Kountze on US 69, take FM 418 East; go approximately 3.2 miles to Village Creek; turn right onto launch site road before crossing the Village Creek bridge. From Silsbee on Business 96, take FM 418 West; go approximately 6.9 miles to Village Creek; turn left onto launch site road after crossing the Village Creek bridge. From Silsbee on Business 96, take SH 327 West; go approximately 3.6 miles to Village Creek; turn left onto launch site road after crossing the Village Creek bridge. From Kountze on US 69, take SH 327 East; go approximately 2.1 miles to Village Creek; turn right onto launch site road before crossing the Village Creek bridge. From Lumberton on US 96 North, go approximately 2 miles to Village Creek; turn right onto launch site road after crossing the Village Creek bridge. From Silsbee on US 96 South, go approximately 4 miles to Village Creek; turn right onto launch site road before crossing the Village Creek bridge. 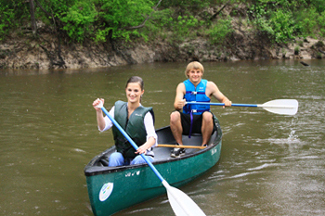 Paddling time can vary depending upon water levels and flow rates. 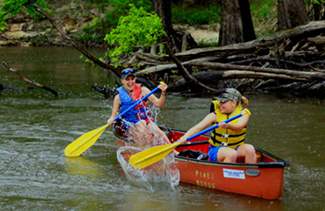 Individual segments of the trail can be paddled in 2 to 5 hours of paddling. The entire trail is too long to paddle in one day. Overnight camping permits are free and available at the Big Thicket National Preserve Visitor Center. Please note: The water quality of the creek is variable, but not recommended for drinking. 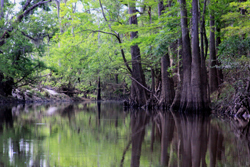 Village Creek is within the boundaries of Big Thicket National Preserve; all federal laws and regulations apply. Village Creek is a flat-water stream with several smaller streams, oxbow lakes, and sloughs connected to the creek. Although there are no human built obstructions on this stream, there may be snags, logjams, and sandbars to avoid or portage around, especially when water levels are low. Heavy rains and high water can create dangerous conditions. Village Creek is a natural creek that is unrestrained by flood control dams or other human built structures. As such, the creek is readily influenced by rainfall runoff that may create temporary high flows. Heavy rains and high water can create dangerous conditions and deceivingly swift currents. Flood warnings and stream flow information is available to paddlers from NOAA (National Oceanic and Atmospheric Administration) or from the U.S. Geological Survey. The creek supports numerous species of fish including bass, crappie, catfish, and sunfish. Small lures such as jigs, plastic worms, spinner baits and light-line are recommended. Heavier line is recommended for catfish and gar. Live bait tends to work better due to low light conditions of the creek. A fish consumption advisory exists for the creek and surrounding bodies of water and information can be found online at the Department of Health and Human Services. Due to elevated mercury levels found in crappie, gar, and largemouth bass, it is recommended that adults and children limit their monthly consumption of these fish and that women who are pregnant, nursing, or who may become pregnant do not consume these types of fish. The riparian corridor of Village Creek supports a great diversity of plant and animal life along the creek and beyond the banks. The Big Thicket area is known as the biological crossroads of North America since more species of plants and animals occur in this area than any similar sized area of North America. Birds spotted here include belted kingfisher, wood ducks, and numerous species of egrets and herons. Bald cypress, water tupelo, and black willow trees grow along the creek while pines, oaks, and over a hundred other tree species grow in the forests and bottomlands surrounding the creek. Common wildlife encountered includes white-tail deer, raccoons, turtles, fish, snakes, freshwater mussels and the occasional otter or beaver. Although common to the Neches River watershed, alligators are rarely seen in the creek due to natural springs creating cooler water temperatures. 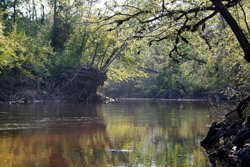 The entire Village Creek Corridor is within the boundaries of Big Thicket National Preserve. All federal laws and regulations apply. In some areas the boundary is just above the high water line, so watch for preserve boundaries posted with signs and yellow paint. Respect private property by not trespassing or littering and keeping noise levels down. This creek is classified as navigable, which permits public use of the streambed and, if necessary, the banks to portage any hazard. Any other use of private river banks without permission of the landowner can be considered trespassing. Under Texas Penal Code (§30.05), criminal trespass occurs when one enters property after receiving notice not to enter. Notice includes verbal notice, a fence, sign(s), purple paint on posts or trees, or the visible presence of crops grown for human consumption. 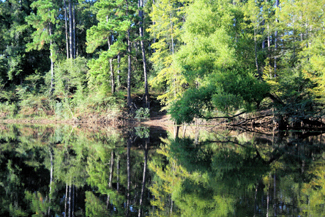 The Big Thicket is a unique area known for its rich biological diversity. Big Thicket National Preserve protects habitats in an unusual mix of common plants and animals as well as rare and endangered species. The National Park Service provides for outdoor recreational use while preserving and restoring this precious ecosystem that has been designated an International Biosphere Reserve and recognized as a Globally Important Bird Area. Hiking trails, primitive camping, horse and bike trails, canoe/kayak/boating, birding, hunting, fishing, and ranger led programs are all available and free to the public. Permits required for backpacking, overnight creek and river use, and hunting are available at the visitor center. The Preserve visitor center also offers exhibits, information, and films and is open 9am-5pm daily. Information: 409-951-6700. Stretching across more than 5,500 acres in East Texas, the Roy E. Larsen Sandyland Sanctuary harbors rare and endangered plant life, including one of the last significant longleaf pines communities in Texas. The preserve is a unique combination of upland and wetland longleaf pine savannas, American Beech-Southern Magnolia slope forests, bottomland hardwood forests and bald cypress-water tupelo swamps and it sustains 727 plant species and 234 animal species. The sanctuary is part of a comprehensive effort to protect and restore a longleaf pine ecosystem that once stretched across 90 million acres from Virginia to Texas but that has been reduced to just 2 percent. The preserve — designated Site No. 17 on the Upper Coast section of the Great Texas Coastal Birding Trail — is open to the public at no charge during daylight hours for nature study, photography, hiking or paddling. To learn more about the Roy E. Larsen Sandyland Sanctuary, or any of The Nature Conservancy of Texas’ 35 preserves and projects, call (409) 385-0445 or visit The Nature Conservancy's Texas site. The Kirby-Hill House is nestled in Kountze, Texas, and also in the heart of the Big Thicket of East Texas. Our grand old home was built in 1902 and rescued by the Kirby-Hill House Educational Foundation in 1992. Since then we have made great strides to restore this home, and it is now a Bed & Breakfast and a "working" Museum. Architectural features include curved inside walls and a beautiful spiral staircase. Located at 210 West Main, Kountze, TX. Contact us online or at (409) 246-8000 for lodging and questions. The Ice House Museum commemorates the beginning of ice manufacturing in the south. The building was constructed in 1928 by Gulf States Utilities. When sold to an individual in 1943, production had reached about 30,000 tons of ice a week. After the demand for ice declined, the doors closed in the 1970s reopening in 1990 as a museum, art gallery, and cultural center. In addition to annual events, local area artists are featured in monthly exhibits, ice house artifacts are on display, and the lower gallery houses a unique display of military uniforms on long-term loan. The museum, located in Silsbee, is open Wednesday through Friday from 10:30 am – 3:00 pm and on Saturdays from 9:30 am – 2:00 pm. Since its first production in 1967, Silsbee Little Theatre (SLT) has been a highlight of evening entertainment for generations of Southeast Texans. A rare jewel among organizations of its type, SLT is an exceptional small town theater that offers an annual dinner theater presented each spring. For information, dates, and times contact the Silsbee Chamber of Commerce at 409-385-5562 or online. This trail was made possible through a partnership between Texas Parks and Wildlife Department,Big Thicket National Preserve, Kountze Chamber of Commerce, Lumberton Chamber of Commerce, Silsbee Chamber of Commerce, The Nature Conservancy (Roy E. Larsen Sandyland Sanctuary), and Village Creek State Park.